We’d love your help. Let us know what’s wrong with this preview of Invisible by Jim C. Hines. 13 essays on the importance of representation in science fiction and fantasy, with an introduction by author Alex Dally MacFarlane. Proceeds from the sale of this collection go to support the Carl Brandon Society. “Boys’ Books” by Katharine Kerr. “Clicking” by Susan Jane Bigelow. “The Prince 13 essays on the importance of representation in science fiction and fantasy, with an introduction by author Alex Dally MacFarlane. Proceeds from the sale of this collection go to support the Carl Brandon Society. “The Princess Problem” by Charlotte Ashley. “Autism, Representation, Success” by Ada Hoffmann. “Gender in Genre” by Kathryn Ryan. “‘Crazy’ About Fiction” by Gabriel Cuellar. “Evil Albino Trope is Evil” by Nalini Haynes. “Non-binary and Not Represented” by Morgan Dambergs. “Representation Without Understanding” by Derek Handley. “Shards of Memory” by Ithiliana. “I Don’t See Color” by Michi Trota. “SFF Saved My Life” by Nonny Blackthorne. Neither lengthy nor academic, these are well-written, very personal essays on the effects of NOT being represented in the kind of fiction one most enjoys- and/or being represented badly and inaccurately. Obviously, some reflected my own experiences more closely than others, but the others were in many ways more rewarding perspectives. It's all too easy for any of us to be very aware of our own issues, but oblivious to those faced by other people, and I welcomed the heartfelt accounts that opened Neither lengthy nor academic, these are well-written, very personal essays on the effects of NOT being represented in the kind of fiction one most enjoys- and/or being represented badly and inaccurately. Obviously, some reflected my own experiences more closely than others, but the others were in many ways more rewarding perspectives. It's all too easy for any of us to be very aware of our own issues, but oblivious to those faced by other people, and I welcomed the heartfelt accounts that opened my eyes more and raised my consciousness. Wow. This is a great set of essays on inclusion/exclusion--in writing and other entertainment media--from the point of view of so many "groups" of people that it almost felt overwhelming. Placing the final essay in that place, though, was a masterful stroke. It toned down the "oh, look at all this stuff I have to think about!" feeling that started creeping over me, and replaced it with a sense of encouragement, of anticipation of my and others' attempts at including people of groups often overlo Wow. This is a great set of essays on inclusion/exclusion--in writing and other entertainment media--from the point of view of so many "groups" of people that it almost felt overwhelming. Placing the final essay in that place, though, was a masterful stroke. It toned down the "oh, look at all this stuff I have to think about!" feeling that started creeping over me, and replaced it with a sense of encouragement, of anticipation of my and others' attempts at including people of groups often overlooked or poorly stereotyped. I feel comfortable rating this at five stars while it's still on my "I want to read" shelf because I read the essays in their original form on Jim C. Hines' blog. I've purchased my need-to-own copy, and I'm looking forward to revisiting these powerful, personal stories soon. Go buy this book now. Prepare to feel uncomfortable in the best possible way. Prepare for some feels, and brace yourself for the possibility that you'll want to do some serious introspection. These are words that needed saying I feel comfortable rating this at five stars while it's still on my "I want to read" shelf because I read the essays in their original form on Jim C. Hines' blog. I've purchased my need-to-own copy, and I'm looking forward to revisiting these powerful, personal stories soon. These are words that needed saying. Now they need sharing. Go forth and do both. "I saw all the mirrors on earth and none of them reflected me..." (Jorge Luis Borges). This book is a collection of essays representation in SF/F. Individually the essays explore the lack of characters of color, various genders, queerness, nonNeuroTypical minds, and representation without understanding (disability, always-the-villain, not-seeing-color). I read this for my 2016 Reading Challenge "read a book of essays" (Bustle Reads). A thought provoking collection of essays on the the importance of diversity in sci/fi and fantasy. I could easily relate to a few of the essays and gave some heavy thought to the others and after reading this I will think twice about what I choose to read next. Read a lot of these when they were published on Hines' site, then immediately bought the ebook when it went on sale. Important voices for an important project, and a must-read for anyone with even a tiny ounce of interest in representation in genre fiction. This is an amazing series of essays on representation in SF/F. A quick, important read for anyone who wants to be a better writer, but geared toward sci-fi/fantasy. There are three volumes of essays, and this is the first. I plan on ready the other two as well. One note: I was only able to find them as a Kindle file, and I don't have a Kindle, so I am reading them in my browser. No problem. I have many, many thoughts, but I feel like writing them all out now on Goodreads would be kinda navel-gazey. But if any of my friends wants to chat about issues of repr A quick, important read for anyone who wants to be a better writer, but geared toward sci-fi/fantasy. There are three volumes of essays, and this is the first. I plan on ready the other two as well. One note: I was only able to find them as a Kindle file, and I don't have a Kindle, so I am reading them in my browser. No problem. Thought provoking collection of personal essays allowing you to see beyond your own limited perspectives. Highly recomended if you want to broaden your character scopes, or understand that your normal is not the same as everyone elses. My Kobo tells me I read this book in 16 minutes, which I find hard to believe. Even if it really took five times as long, in terms of value per unit time, it is hard to beat. This collection of moving and informative essays by marginalized people from the SFF community, especially when read as quickly as I did, hammers home the need for authors to represent a wide diversity of people in their stories. It deserves a reread, with pauses after each essay to reflect on Lessons Learned. Evie Kendal reviewed this book; for more reviews by Evie, see Evie Kendal on Dark Matter Zine. To see all reviews on Dark Matter Zine, go to Dark Matter Zine's reviews. “Art without a default, without dominant voices–imagine it! The writers in Invisible want to. Art without a default is art where Evie Kendal reviewed this book; for more reviews by Evie, see Evie Kendal on Dark Matter Zine. To see all reviews on Dark Matter Zine, go to Dark Matter Zine's reviews. The collection addresses the absence or stereotyping of certain groups, exposing a tradition of racism, sexism, homophobia, transphobia and ableism in popular culture. Each contribution uses personal experience to give the reader an insight into other perspectives on how humans can and should live their lives, rejecting narrow definitions of acceptable expressions of fundamental human experiences, such as sexuality, challenging the dominant cis-gendered heteronormative discourse. As such, every contribution is unique and highly recommended, however, for the purposes of this review I have chosen to focus on just four. First is “The Princess Problem” by Charlotte Ashley, which discusses racial identity in the context of children’s books and merchandise. Ashley gives the example of a colouring book containing pictures of princesses, that her daughter insisted had to be coloured in “the RIGHT colour” – in other words, the colour of the “normal” princess dolls (white) rather than the token “diversity” dolls (brown) given solely to children of colour. She brings attention to the fact that not being consciously aware of racial stereotyping in children’s products contributes to discrimination, and that brown princesses – and the diversity they represent – are for everyone. “Gender in genre” by Kathryn Ryan addresses the lack of trans* characters in fiction. She (possibly Xe, but I am basing my assumption on the first person bio provided as I have not had the opportunity to ask the preferred pronoun) notes that even where trans* characters do exist in fiction they tend toward one of two options: victims or freaks. The lack of queer and asexual characters is also addressed, and from my personal experience the only asexual character I’ve ever read about was in Karen Healey’s Guardian of the Dead. She also laments the fact that when trans* people do appear in fiction it tends to be exclusively in trans*-themed books, which can work against normalisation and integration (much like the brown princess dolls only for brown children argument discussed above). For those interested, a study regarding the impact of gender representation in the media can be found here. Dark Matter’s own Nalini Haynes’ contribution “Evil Albino Trope is Evil” discusses the overwhelmingly negative representation of albinos in popular culture, including Deep Space Nine and The Da Vinci Code. Haynes notes the evil albino trope is so pervasive it is now self-referencing and parodied – in other words, audiences are expected to fall for misdirection involving the motives of an albino, due to frequent prior exposure to this trope leading to a presumption of guilt for any albino character. Like the other pieces in the anthology, Haynes relates personal experiences to demonstrate how unfair and unbalanced representation of a minority in fiction can impact the treatment of members of that group in the real world. Nonny Blackthorne’s “SFF Saved My Life” discusses the unique position science fiction and fantasy has as a site for encouraging diversity. She (again pronoun assumed from bio) recounts her childhood living in a fundamentalist religious family and how she couldn’t reject homosexuality or polyamory as they might have wished because she had already bonded with people who engaged in these lifestyles, albeit fictional characters from within SFF. This also helped with self-acceptance in the face of familial rejection. The idea that empathy for a diverse range of people can be encouraged through identification with fictional characters was tested in this study, summarised by i09 here. I have to admit, I found the quality of the essays in this book sort of all over the place. The first few were just...sort of there. They were short and didn't seem to have much point. As the book went on, though, the essays got better. All of the authors of these essays are different from the general populous for one reason or another. Some of the essays were lamenting the lack of characters like the author in stories. Some were talking about how characters like them were not portrayed accuratel I have to admit, I found the quality of the essays in this book sort of all over the place. The first few were just...sort of there. They were short and didn't seem to have much point. As the book went on, though, the essays got better. All of the authors of these essays are different from the general populous for one reason or another. Some of the essays were lamenting the lack of characters like the author in stories. Some were talking about how characters like them were not portrayed accurately. A few listed good examples of how their differences are represented. This is all very valid criticism of sci-fi and fantasy literature. I think it was geared towards authors, reminding them to diversify their casts of characters. But as a reader, I think it's made me start to think in more detail about the portrayal of characters. I picked this up to read when it was released in April because Jim Hines is the editor and I like that he's been a strong proponent of equality. I've been following the debates in the SciFi community fairly closely over the last year regards racism and sexism and other isms and I know I don't know as much as I should so I decided to give this a try. Honestly, I expected to saddened and angered by the essays but I also expected the reading to be a bit difficult and sometimes for it to get ranty s I picked this up to read when it was released in April because Jim Hines is the editor and I like that he's been a strong proponent of equality. I've been following the debates in the SciFi community fairly closely over the last year regards racism and sexism and other isms and I know I don't know as much as I should so I decided to give this a try. 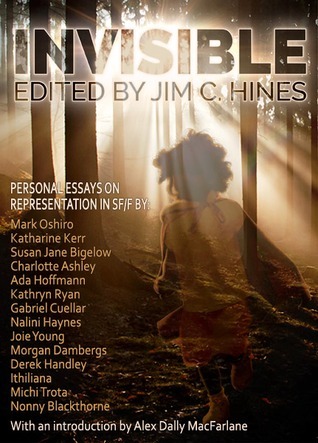 This is an anthology of personal essays from fans and creators of sf/f, about finding or not finding representation for parts of their identity in sf/f. This is the first volume, and I recommend continuing with Invisible 2 for even more personal stories. The essays are very readable and most people will probably relate personally to at least one or two of them. More importantly, for the ones you don't personally relate to, you can begin to understand how others are viewing the stories and characte This is an anthology of personal essays from fans and creators of sf/f, about finding or not finding representation for parts of their identity in sf/f. The essays are very readable and most people will probably relate personally to at least one or two of them. More importantly, for the ones you don't personally relate to, you can begin to understand how others are viewing the stories and characters that you're consuming. This began as a series of guest posts on Jim's blog about representation in SFF and is now an expanded e-book, with the proceeds going to Con or Bust. The original essays did a great job of going beyond just gender and racial/ethnic diversity (although those are there and they're great). I'm very excited to read more. Some eye opening ideas in here. Unless you're convinced that SFF should only maintain the status quo, endlessly repeating memes from the 20th century, you're going to want to challenge your understanding of the fiction. This is a good starting point written by a collection of thoughtful people. The essays in this collection certainly make the case for diversity and representation in science fiction and fantasy. A good resource for authors looking to add depth to their characters. An easily digested series of short essays on representation in speculative fiction. The essays are personal, rather than academic, and as such some resonated more strongly with me than others... which is kind of the point. Important conversations, inconsistent quality and relevance. These are beautiful essays about why there is a need for more than whole, white, male figures in books. It is about the importance of representation, and quite frankly should be required reading. A great collection of essays on why diverse representation is so important in books and other media. Inspires me to read and write at the same time. Each essay taught me and made me long to create more and more diverse characters. I hope every writer reads this book. I'll be shelving this one somewhere close by so I can look back at it for reading recommendations and especially for reminders for my own work.